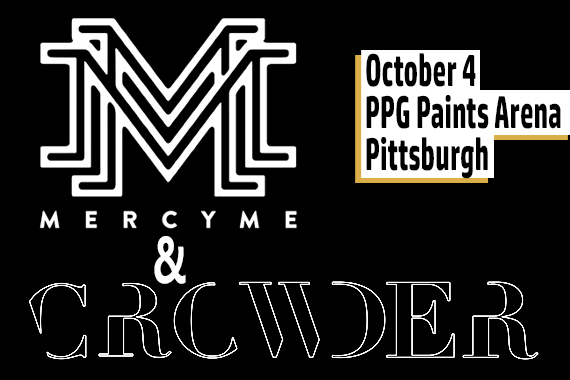 (BEAVER FALLS, Pa.) – Geneva College announces Grammy nominees MercyMe and Crowder will perform on October 4, 2019 at PPG Paints Arena in Pittsburgh in a Generation Exodus production. As a concert sponsor, Geneva will offer community-priced tickets, which go on sale later this month, April 2019 at Geneva.edu. MercyMe has won multiple American Music Awards and DOVE Awards. They have also been nominated for six GRAMMY awards. The band is comprised of lead vocalist Bart Millard, Robby Schaffer on drums, Nathan Cochran playing the bass, and guitarists Michael Scheuchzer and Barry Graul. The band was founded in 1994 and has continued to grow in success since the release of their hit song “I Can Only Imagine” in 2001. The story of Millard's journey to writing the song was told in the 2018 film, I Can Only Imagine, which was the number 37 top grossing film of the year in the United States. Crowder, the stage name of Grammy nominated artist David Crowder, will join Mercy Me on stage in Pittsburgh. Crowder was born and raised in Texas and now lives in Atlanta, GA. Initially performing as the frontman for the David Crowder Band, David Crowder started his solo career in 2012. He has nine top 10 Christian albums during his career, including all three of his solo albums, Neon Steeple (2014), American Prodigal (2016) and his latest I Know A Ghost (2018).